Each girl, intending to get married, is interested inFashion trends of modern times. Many prefer to take "for service" only some nuances, wanting to appear before her husband in a traditional white dress. But some girls want to keep abreast of all new products and know what are the trends of the wedding fashion of 2015, including. It is not fair to say that onlyWomen want to look in the spirit of modernity - many men do not want to lag behind and also closely follow the new collections of leading brands. The completeness of the image is affected by many factors. To make it perfect, they should all be in harmony. It concerns both men and women. How much all you need to consider a girl to be the most beautiful of all brides! This is perhaps the most important element of the image. What does the wedding Fashion 2015 Year to create it? Separate outfit. If you want to emphasize your slender mill and pay attention to a sharp figure, this style will allow you to do it. Especially popular are shortened tops that open a beautiful tummy, and a long skirt that introduces a puzzle and lengthens the silhouette. Not always brides preferred exclusivelyWhite outfits - the history of wedding fashion says that they could be different colors depending on the season, religious holidays, etc. This year the trend is blue, mint, pink. But the classic remains a classic - if you prefer white, you will not go wrong. As for the decor of the attire, eminent couturiers recommend not to overdo it - the less embroidery, sequins, crystals, beads, colors, crystals, the better. But lace is better not to give up. Their actuality is not lost wedding dresses, made in the styles of "case", "mermaid". The most original trend of this season is the decoration, made of a material with a print like a newspaper. After buying a dress you need to pick up shoes. This year, a suitable option for yourself will find a bride who appreciates comfort, and a girl for whom only beauty is important. You can choose the always fashionable "Boats". To give them a new "Sounding ", They can be decorated with lace, flowers or fathin (if you do not find a ready-made model with such a decor on sale). The heel of them can be decorated with rhinestones orBeads, but in this case the top of the footwear does not require additional decor. The exception may be "boats", decorated with pearls of the same color as the main material. 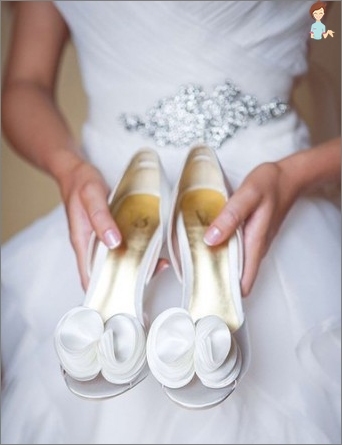 Today in fashion, bridal shoes with an open toe. You will not be mistaken, and, choosing shoes, the top of whichIs made of satin. Especially harmoniously, they are combined with a dress made of the same material. At all times, the atlas was associated with luxury. Today its cost is not so great, but its merits and posh it does not detract. 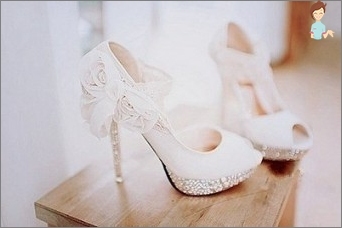 The highlight of the wedding decoration will be shoes withGlitter silver, golden tone or the color of the ivory. So that the shoes do not overshadow all the other elements, it should not have a fancy decor, its style should be concise. For women of convenience, low-heeled shoes are suitable. Usually they have the form of ordinary "Boats"And decorated with lace, beads. One of the trends in the world of wedding fashion in 2015 is retro sandals. The color gamut in which can be executedShoes, very diverse - from white to black. Its color may depend on the tone of the dress, but if your dress is white, do not be afraid to choose shoes of absolutely any tone. Preference in this season should be given a golden, silvery, lilac shades. Moden this year and the color of tin. Of course, an aging and always topical option is white shoes. For a woman, well-groomed hair is one of the guarantees of an ideal appearance. 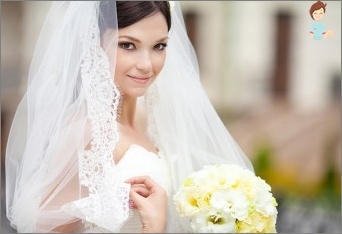 Correctly chosen hairstyle for the bride is the guarantee of the completed image. In addition to the style of minimalismIt is better to have a similar hairstyle. The best option is to grab the hair from behind on the back of the head or the crown. At the same time, you can choose a large, bright diadem. In today's trend, and casually laid curls,Giving the bride playfulness and carefree. Elements of this laying can become slightly disheveled tails, casually braided plaits. You can grab your hair with a large barrette, and a diadem for this style will not be needed at all. Modern trends of wedding fashion suggest the weaving of all kinds of braids, which can be stacked using ribbons, laces, flowers. Such hairstyles look great on long hair. Do not lose their relevance and "Tufts". They are decorated with diadems, beads, hairpins. Strands must be neatly laid. Playful "Curls"Will also be a great addition to your image. It should be noted that they should not be small. Large curls, intercepted by an invisible barrette, can be decorated with ribbon, flowers. Holders of short hair should pay attention to the retro style - "square","Waves", Bundles. To emphasize the peculiarity of appearance will allow a hat with a veil, a large hairpin or a flower, a veil in the style of bandanas. The main trend of this season is the effect of wet hair, which looks great on a short haircut. Undoubtedly, wedding, evening fashion and accessories are inextricably linked. Only in tandem with accessories the outfit will allow the bride to find a special charm. The first thing to pick up for a dress is a veil. For a fluffy skirt, the round shape attribute is suitable. A straight dress will be complemented by a long veil, and an outfit in the style of "mermaid"Is short. If you need to visually increase your height, pick up the accessory to the waist and fasten it over the hair. Do not braided hair veil should cover. Practically for any hairstyle a diadem will suit. The exceptions are those for which you have already picked up a large hairpin or flowers. Picking up jewelry, pay attention to the fact that they must be executed in one style. Under the outfit and shoes, generously decorated with various decorative elements, it is better to choose a low-key costume jewelry. When you come to the wedding fashion salon, you will most likely see accessories such as a handbag, garter, umbrella. They really give "Zest"To the image of the bride, but all these elements must not be pretentious, but to pick them up stands in line alongside. Modern currents will make it possible to draw interesting ideas and for "Dandy"Of our days. 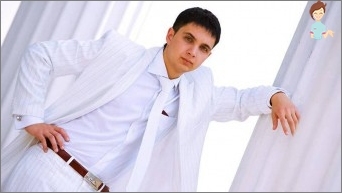 In this season, the most urgent for the groom is a white suit. All the elements of the outfit must be made in this color. For men who consider the black color of mourning, you can choose a dark suit with bright elements, for example, with white or steel edging. Instead of a black outfit, a blue or gray suit would be appropriate. A white shirt is also allowed to be replaced, for example, with a printed shirt. Tie, scarf or butterfly? To your taste. Playful tie this year - not a taboo, but it should be in harmony with the suit of the groom and the bride's dress. In the trends of wedding fashion in 2015 for men an important place is given to watches, boutonniks, tie clips - all these accessories complete the image. Footwear of the groom should be made of leather without texture, and its color should be darker than the color of the suit. Using the ideas of leading couturiers, you can create a unique, ideal image.